Acoustic Geometry is a recently launched subdivision of Acoustical Surfaces, one of the oldest and largest suppliers of acoustic products for noise control to recording studios, band rooms, houses of worship, businesses, and industrial facilities. The Acoustic Geometry division offers a full line of individual acoustic isolation and treatment products, as well as packages designed to treat entire rooms. AG was founded by John Calder, a musician turned recording engineer turned studio designer. John has many A-list record credits, including being mix engineer on Neil Diamond’s four-million-seller Beautiful Noise. Incidentally, Calder chose the Large Advent hi-fi speaker (1975 vintage) to mix that record rather than the standard studio monitors of the day. That fact alone says much about his audio sensibility. As part of his more recent studio-design work, Calder developed a few core technologies and products that have become the foundation of the Acoustic Geometry line for professional and home use. The Fabric-Wrapped Panel (FWP) is a straightforward flat panel for absorbing mid and high frequencies, and for killing flutter echo. Nothing unusual there. But the other two components of the Acoustic Geometry line differ considerably from conventional acoustic treatments. One of these products is a bass trap for room corners (called the CornerSorber) that works through diaphragmatic absorption via a membrane rather than typical frictional absorption. The second core product is a cylindrical-section diffuser (called the Curve Diffusor) that also incorporates diaphragmatic bass absorption. All three products measure roughly 2' by 4', with varying depth (see Specs & Pricing for details). Acoustic Geometry has packaged combinations of them into a range of nine turn-key bundles, with the appropriate product mix to treat any size room. These bundles range from the Home Room Pack 1 ($453) to the Pro Room Pack 12 ($7452). Each of the items in the Room and Pro Packs is also available separately. Acoustic Geometry has made it easy for the audiophile to choose the right acoustic treatments for his or her particular room through a series of excellent videos and white papers available on the AG website. The site’s instructional videos offer many practical demonstrations of the principles explained, and are a great resource for learning about noise control and room acoustics. The packaging of the various components into a single whole-room treatment system, along with AG’s placement suggestions for those components, takes the guesswork out of what products you need and where you should position them. As I’ve mentioned, I’m building a new listening room, but until that is ready, I’m living in a temporary place with a less-than-ideal listening space (the new room will be finished by the time you read this). My temporary room, which measures 27' x 20' x 8', has lots of windows, and needless to say, no acoustic treatment. After reading Calder’s Audio Engineering Society paper on the CornerSorbers and Curve Diffusors, and watching the many informative videos on the Acoustic Geometry website, I decided to try a Pro Room Pack 10 ($6796). I installed it about seven months ago and have experimented extensively with it over that time. The Pro Room Pack 10 consists of two pairs of CornerSorbers, ten Medium Curve Diffusors, and eight Fabric-Wrapped Panels. Acoustic Geometry supplied a drawing showing the ideal placement in my particular room (shown on the previous page). These products can be mounted on your wall or on available wooden stands. Because I didn’t want to put holes in the rental-house walls, and valued the flexibility of moving the treatments while they were under review, I elected to use the stands. The stands are nicely finished light-colored wood, but in practice they’re a little awkward to manipulate if you have a lot of them in a room. In a normal situation I would definitely mount the treatments to the walls. The Curve Diffusors and Fabric-Wrapped panels attach to walls with short pieces of Z-channel, commonly used for hanging framed pictures. The CornerSorbers are finished in black-painted wood, and the Curve Diffusors and Fabric-Wrapped Panels are available in various fabric colors. The Curve Diffusors are also available in a range of natural wood finishes as well as automotive paint colors. 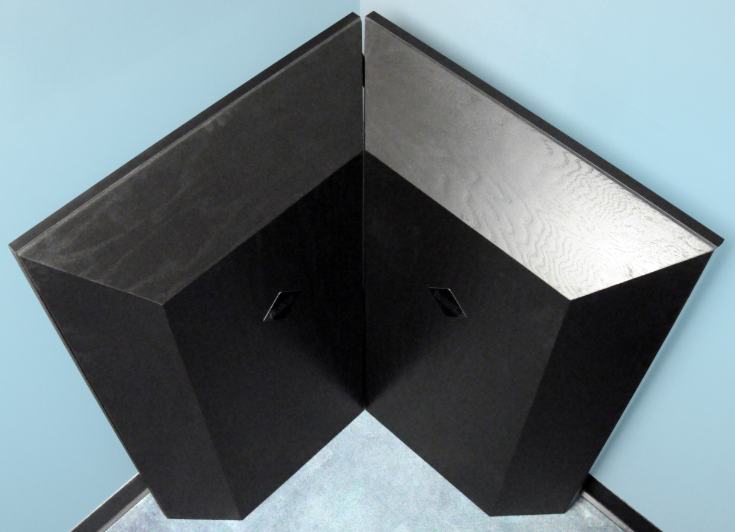 The bass-absorbing diaphragm on the CornerSorbers and Curve Diffusors is a thin sheet of vinyl loosely covering the rear, which isn’t visible when the products are installed. The build-quality is high, and the fabric-wrapped products are attractive. Dozens of fabric options are available. The CornerSorbers are part of the five Pro Room Packs, and are also sold separately for $998 per pair. The device is a six-sided wooden structure with a vinyl membrane on the back side that faces the wall. They are intended to be used in pairs positioned tightly in the room corners behind the speakers and right against the wall. Their beveled edges allow them to fit close to each other in the corner, almost forming a single unit. The tight proximity between the membrane and the wall is key to their operation. At the room boundaries, the velocity of sound is at a minimum, and pressure is at a maximum. 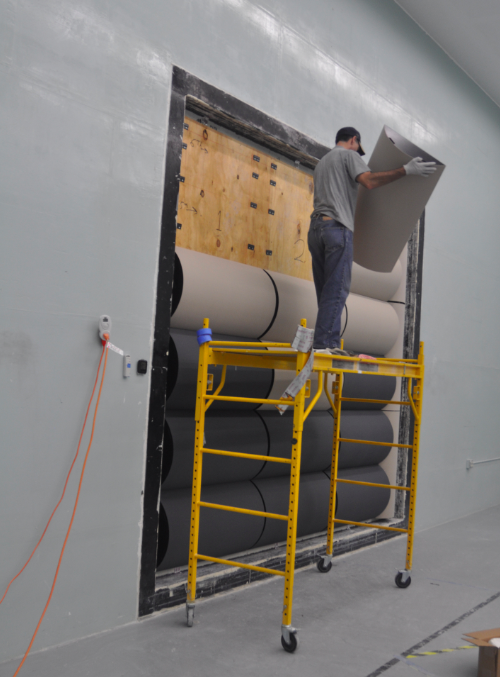 The vinyl membrane on the wall-facing side of the CornerSorbers is 3" from the wall, right in the zone of highest pressure. The diaphragm is moved back and forth by varying acoustic pressure, absorbing bass. As Calder explains in his AES paper, reducing the amplitude of a room-mode-induced pressure peak through this diaphragmatic absorption results in a corresponding reduction in the depth of a cancellation. The result is flatter and smoother bass response. Measuring the performance of bass absorbers is a tricky business. It requires an inordinately large testing chamber—the larger the chamber, the lower the frequency at which the bass absorber’s effect can be measured. Even the largest acoustic chambers (about 300 cubic meters) are only accurate down to 160Hz. Consequently, a typical bass absorber’s published performance parameters below 160Hz are estimated theoretically rather than being measured directly. Unfortunately, most problems in normal-sized listening rooms occur below 200Hz, exactly in the range where measurements begin to fail. But Calder wanted definitive measurement data while developing the Acoustic Geometry products, and arranged to test the prototypes in a unique space perfectly suited to the task—a nuclear reactor containment dome that had been converted into a massive acoustic testing chamber. (Don’t worry; the reactor had never been brought on-line.) That facility is located in Elma, Washington, and features the two largest independent acoustic test chambers in the world. These chambers, one measuring 738 cubic meters, allow accurate measurements down to 40Hz. This acoustics lab is run by a former NASA scientist who has written extensively in academic journals on acoustic testing. The paper includes photos of the products being tested in the giant chamber, along with the measurement results. I’ve included here a photo of the Curve Diffusors being mounted in the test chamber, and the graph showing the amount of absorption (in Sabins) vs. frequency for three different combinations of CornerSorbers and Curve Diffusors. Calder also describes in the paper how the measured performance of the various prototypes wasn’t what he expected, leading him to refine the design in unexpected ways. From this experience, he draws the conclusion that low-frequency absorption products that were designed from theory alone, rather than as the result of empirical testing in a suitable laboratory, cannot deliver guaranteed performance.